1. Preheat the oven to 200ºC, gas mark 6. Prick the potatoes with a fork in several places and bake for 1 hour, turning from time to time until the skin is dark and crispy and the potato is cooked through. 2. Meanwhile, heat the oil in a large saucepan and cook the onion and pepper for 10 minutes until well softened and golden. Stir in the ginger, chicken and curry powder, and cook for 1 minute. Stir in the tomatoes and bring to a simmer. Cover and cook for 20 minutes then remove from the heat and stir in the mango chutney. 3. Split open the baked potatoes and spoon in the chicken curry. Top each with a spoonful of yogurt then sprinkle over the chilli and serve with a good grinding of black pepper. 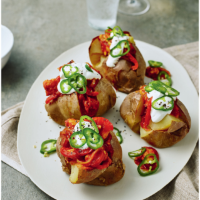 Cook’s tipSwap the baking potatoes for sweet potatoes for a flavour twist.